MK Bezalel Smotrich slams 'legalism,' calls to bring down 'terror-supporting' Palestinian Authority. National Union Chairman Bezalel Smotrich on Monday responded to reports that the IDF is investigating why the soldiers posted at the Ariel Junction failed to respond or attempt to eliminate the terrorist after he stole one of their weapons. 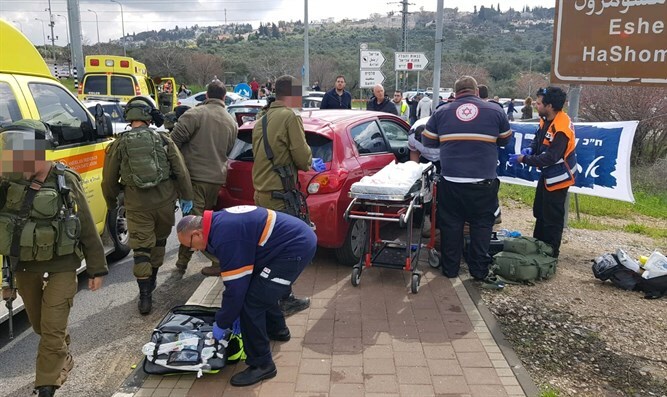 On Sunday morning, a double "combination" terror attack killed one Israeli and injured two others. According to Smotrich, the reason for the soldiers' failure to act is the excess legalism of the IDF. "Don't you dare say that excess legalism has a calming effect," Smotrich tweeted . "Don't you dare attack lawyers. Just continue dying silently." "The Palestinian Authority (PA), which supports and encourages terror, needs to be brought down - not fixed up. The Oslo mindset which turned the PA into a terror-combating contractor of the IDF has cost us too much blood. It's time we gave it up." "[PA Chairman Mahmoud] Abbas is no better than Hamas," he emphasized. Large forces of IDF, Shabak (Israel Security Agency), and Israel Police officers are operating in the Arab village of Bruqin, where it is believed the terrorists who carried out Sunday's attack are hiding. Initial investigations show that two terrorists carried out the attack, and that IDF soldiers shot at them but missed.